The CP40II Cone Penetrometer creates a new parallel between ease of use and superb accuracy. This compact instrument is the world’s best handheld tool for soil surveys involving compaction, trafficability and moisture distribution. Ultrasonic depth sensing, coupled with the optional GPS, makes both this unit and the data you collect extremely accurate. Now with a maximum depth measurement of 750mm, with intervals of 10, 15, 20 and 25mm, it is possible to record up to 75 cone-index data points per penetration/insertion. The increased memory capacity of the CP40II Cone Penetrometer means it can now store data from over 2000 individual insertion readings. Each insertion is capable of having an 18 character sitename, full GPS readings, and useful parameters such as maximum depth, interval as well as time and date of insertion. Additional features include the ability to store the type of GPS being used, either GPS or DGPS (Differential GPS), and the size of the cone being used. All of this enables increased infield operation time minimising return trips to the office.The CP40II Cone Penetrometer is equipped with a graphical LCD that is used to display useful information while taking inserts, or for easy infield reviewing of stored data. Simplified onscreen prompts are displayed to guide the user, making use of the CP40II as easy as possible. 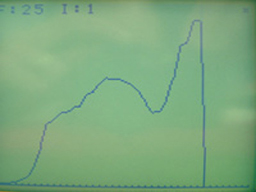 The CP40II Cone Penetrometer constantly monitors the penetration speed, displaying this number onscreen for the user to see. In addition to monitoring insertion speed, the CP40II can alert the user if they exceed the set maximum insertion speed, and can automatically abort an insertion if this speed is exceeded. These features ensure the collected data is as accurate as possible. In the case when an insertion aborts, the user is given the option to save or discard the collected data for that insertion. The CP40II Cone Penetrometer comes bundled with its own retrieval software for computers running Microsoft Windows™ operating systems, including Windows 98 to Windows XP. This software has the ability to graph up to a collection of 9 individual insertions, and allows you to display an average of those insertion data streams.All information like GPS data, Time/Date, and sitename are displayed for each insertion and the software allows for saving to a Cone Penetrometer II Data file for easy viewing later. 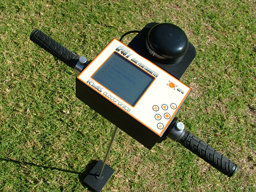 Included in the software is the ability to export the data to a Comma Separated File (CSV), which will open in almost any spreadsheet program, or to export to a Excel XML File, for Excel 2002 and above.The CP40II Penetrometer system comes complete with a GPS receiver, and is neatly contained in a high quality carry case for protection. The shaft is a two-piece unit that screws together with a high-precision thread. 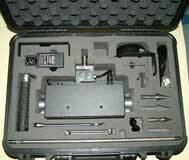 The two-piece design allows the shaft to be packed away neatly in the case for transport.